In an initiative to further engage students in their education, the Renfrew County Catholic District School Board recently hosted two student forums. The forums offered students a chance to have input into what happens in their schools and classrooms, to help shape their learning environment and feel that their opinion matters. “We want to hear the students’ perspectives and use their voice to help inform our work,” noted co-moderator Sandy Brannan, RCCDSB Safe Schools Coordinator. Involvement in student voice activities can also help to increase student engagement and achievement, build skills such as problem solving, leadership and collaboration, and increase students’ ownership of their school community. The sessions on February 12 in Pembroke and February 19 in Renfrew were designed to gather student voice and ideas on four topics—faith, engagement, inclusion, and next steps. After a few fun, ice breaker activities, participants were ready for the day. “We sought to provide students from grade 6 to 12 an adult-like conference experience. 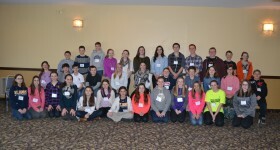 As the day went on and they got to know one another, they became more comfortable voicing their opinions,” noted organizer Jaimie Perry, RCCDSB Superintendent of Educational Services. Approximately 100 participants worked in small groups with a student leader from Bishop Smith Catholic High School or St. Joseph’s High School to tackle the topics at hand. “It was amazing to see them work together, dialogue and support one another. The students who participated in our forums were engaged and eager to share their thoughts,” said Brannan. At the end of each day, students presented takeaways from the forums, which ranged from recognition of the importance of Catholic schools, student voice and engagement, to student involvement in school activity planning, and suggestions for fun, inclusive learning. All the responses and ideas were collected and will be shared with school leaders and teachers.